I love cherry pie. When I was a kid, my mom would get fresh, tart pie cherries to make a cherry pie. I have never been able to find fresh ones, but fortunately, my local grocery store carries a canned variety from the Oregon Fruit Company. The following recipe makes a very big, hearty deep dish pie. Don’t worry if you don’t have both corn starch and tapioca; just use 6 T. of one or the other. Roll out the bottom pie crust and place into pie pan. 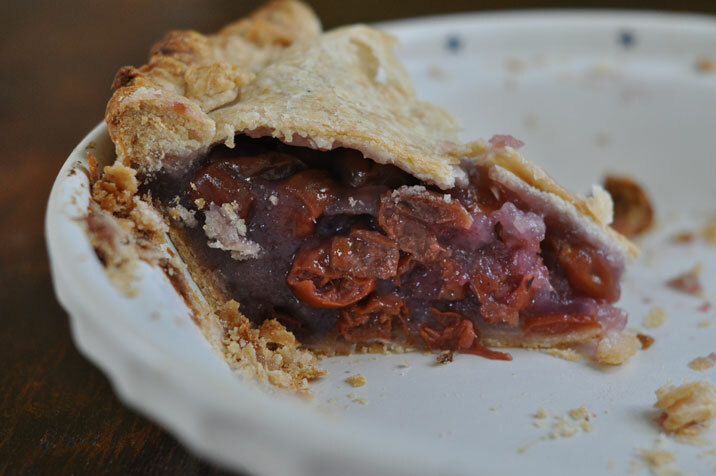 Mix together cherries, sugar, almond extract, tapioca & cornstarch & place in pie crust, dot with butter. Roll out top crust & place on top of filling. Crimp edges to form crust and vent with a knife. Bake for 45 minutes at 400 degrees. Cover crust with foil if it is getting too brown.